3/2010: The Sandy Hook Foundation, local advocates for Fort Hancock’s preservation, was one of five advocacy groups involved in a March 25 summit, hosted by PNJ, focusing on reinvigorating advocacy for previously-listed “10 Most Endangered” places. You can find out more about the summit here. The Fort Hancock and Sandy Hook Proving Ground Historic District reflects the history of a vital defense installation guarding New York City, from 1895 until 1974. The Proving Ground, established in 1874, played a key role in the development of advanced weaponry, as well as radar (during the 1930s). Sandy Hook is also significant as the site for the Spermaceti Cove No.2 Life-Saving Service Station, one of the earliest Federally sponsored efforts to save life and property endangered in coastal shipwrecks. Owned and managed by the National Park Service (NPS), the entire installation is a National Historic Landmark (NHL) and includes nation’s oldest lighthouse, dating to 1764, and over 270 contributing buildings and features, including 16 batteries dating from the late 19th century through the mid 20th century. The Fort Hancock Historic District comprises the core 100 buildings of the NHL. Of these 100, approximately 40 are in use by the NPS, while another 20 house non-profit or education entities and/or are open to visitors. 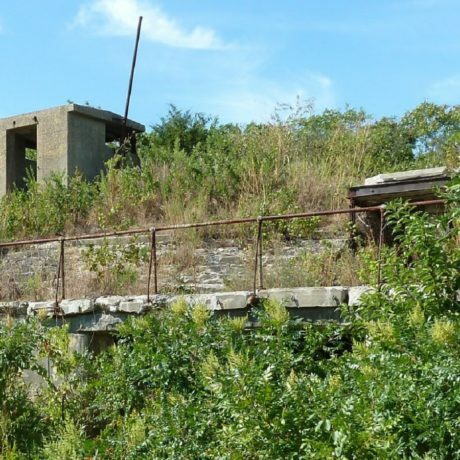 However, another 40 contributing historic buildings in the district, all of which date to the earliest years of the installation (pre-1910), are currently deteriorating and vacant, have been left unoccupied since the cessation of military occupation at Fort Hancock in 1974. The host of significant threatened buildings includes the 1873 Fort Hancock Officer’s Club (the oldest military building in the park) and Officer’s Row, a row of 10 former Lieutenant quarters and the Fort’s most recognized and defining feature. Based on over 20 years of deterioration and neglect by the National Park Service, the 40 vacant buildings of the Fort Hancock Historic District were listed on PNJ’s “10 Most” in 1995. At that time, the lack of a plan for these buildings and the NPS’ poor stewardship and lack of funds for proper maintenance of the prevention of vandalism comprised the imminent threat. In August 1999, the NPS published a “Request for Proposals for Leasing the Historic Fort Hancock Properties.” This request allowed individuals, for-profit and not-for-profit entities to apply to lease the buildings. 32 buildings were made available for lease, including Officer’s Row, the Officer’s Club, the Post Theatre, the Barracks, and various recreational facilities. 22 proposals were received. In September 2001, the NPS signed a “letter of intent” with Sandy Hook Partners, a private developer, based on their response to the 1999 “Request for Proposals.” Their plan proposed a $75 million mixed-use project including education, office, and hospitality services involving 36 of the deteriorating buildings. In 2003, a lease was awarded to Sandy Hook Partners. The award led to opposition from some local constituents who considered the proposed privatization and commercialization of Sandy Hook. The opposition eventually conducted a legal challenge to the award and to the Sandy Hook Partners plan. Legal maneuvers in Federal court lasted six years and ended only in spring of 2009 with the decision that upheld the legitimacy of the lease. However, the lengthy legal challenge and the changed state of the economy prevented successful financing of the plan, and in March 2009, the NPS undertook the review of the financial commitments submitted by Sandy Hook Partners. In October 2009, the NPS announced the lease with Sandy Hook Partners “null and void,” based on the third-party review that “the financing commitments made by Sandy Hook Partners are insufficient to meet the purposes and requirements of the lease.” This determination has halted all plans for rehabilitation for 33 of the 36 buildings targeted for rehabilitation by the Sandy Hook Partners plan. Only three of these 36 buildings: the Chapel, the Post Theater, and the Headquarters building; have been rehabilitated. Sandy Hook Partners was responsible for this work, having entered into a separate lease involving these three buildings in 2007. That lease remains valid. But the 33 buildings for which the Sandy Hook Partners lease agreement has now been revoked remain without maintenance, stabilization, or proper stewardship. There are currently no future plans for these buildings.